Los Angeles bicycle accidents are, unfortunately, on the rise especially in certain parts of L.A. Bicycles have increasingly become popular again as more people move into the larger city areas. The need for transportation in these areas is always in high demand, and own and operating a car is not always practical for city life. Public transportation is not always reliable or available and some people just prefer not to ride a bus or train. With all of this in mind, cities have been adding bicycle lanes and creating more bike routes to accommodate this increase in bicycle traffic. While these improvement have enabled more people to use their bicycles safely, there are still many bicycle accidents that occur each year. A new mapping project started by researchers at MIT’s Media lab may provide a way for cyclist to safe safer around the country and help municipalities discover accident “hot spots” and make changes accordingly. Named the “You Are Here” project, the city is gathering information from police reports regarding bicycle accidents. Using data from 2012, the maps are created for a major city showing where the most accidents occur. Then, using Google Street View for these areas, the map showing the accidents is overlayed on the view to determine if there are visible issues that are causing the high rate of bicycle accidents. Los Angeles was the first map released by the group. It is the intention of the group to release maps using this data for the top 100 cities in the United States over the next year. Over time, additional data and cities will be added to these maps. The bike accident map for Los Angeles shows that there are three roads that are very dangerous for cyclists. 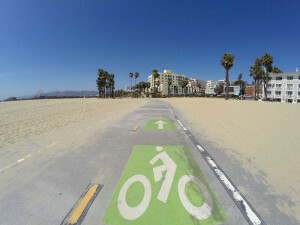 Olympic Boulevard had 72 bicycle related accidents occur in one year, followed by Venice Boulevard with 63 accidents, and Sunset Boulevard with 55 total events. Many of the areas of the city, however, reported some type of accident involving a bicycle. What does this information mean? Well for city officials, they can take this data and use it for improving bicycle infrastructure in these high-risk areas. For the public, cyclists can use the map to determine the danger spots on their bicycle routes so they can be more cautious in those areas. Riding a bicycle for pleasure or transportation should always be done with caution. Cyclists do not have the physical protection that other vehicles provide and accidents can lead to serious and life-changing injuries. If you have been involved in a bicycle accident in the LA area, you are encouraged to speak with a Los Angeles bicycle accident attorney. As an injury victim, you have the right to seek compensation for your injuries and any associated losses. By speaking to an attorney about your accident you will protect your rights as an accident victim. Schedule a free case evaluation and speak to a Los Angeles bicycle accident attorney about your case today.